There is full physical access to all public areas of the museum including galleries, classrooms, shop, café and theatre. If you have any requirements, please ask the Visitor Hosts at the Information Desk on arrival. The museum has original floorboards which are uneven in places. If you are driving to the Museum of London Docklands, please join the A1206 that leads to Ontario Way. Follow it to the left onto Hertsmere Road. The museum entrance is on the quayside (waterside) of the building, which unfortunately is not accessible for vehicles. Due to the current redevelopment in the area, we're afraid that the museum doesn't currently offer disabled parking. There is a public car park directly behind the museum, in Hertsmere Road. Buses 135, 277, D3, D7, D8, N550 all stop near to the museum. River buses RB1 and RB6 stop at Canary Wharf pier (5 mins walk to the museum entrance). View a local map (external link, opens in a new tab). For further information and journey planning, please go to the Transport for London website (external link, opens in a new tab). You may also find this step-free access tube line map useful. The entrance to the museum is on the quayside of West India Quay, which is pedestrian only. Visitors are advised that the pavement in front of the entrance is cobbled. If you feel these cobbles may inhibit your visit please contact us on 020 7001 9844 to discuss alternative arrangements. There is full physical access to all public areas of the museum, including the galleries, learning rooms, shop, café and theatre. The building has original floorboards which are uneven in places. Explore the Museum of London Docklands floor plan and guide to plan your visit further. Please note that the lighting in the Sailortown gallery is lower than in our other galleries. Explore the Museum of London Docklands Visual story to plan your visit further. Visiting the museum with a baby? 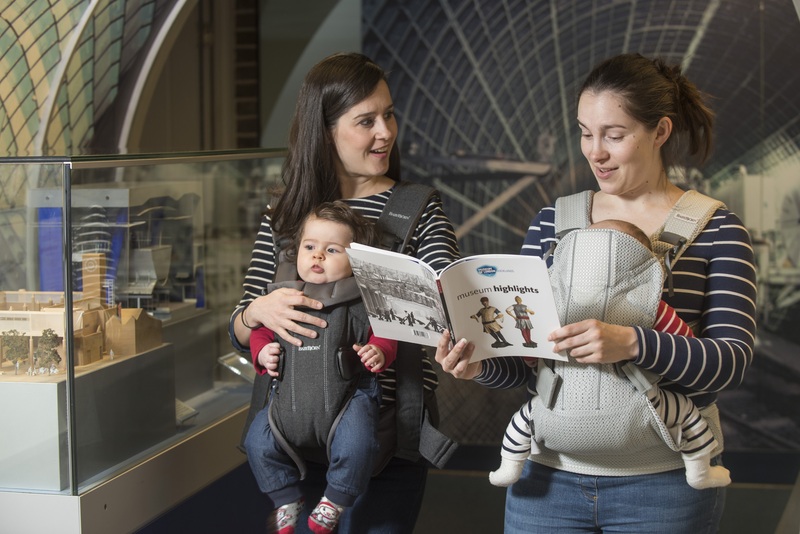 Park up your buggy and explore the Museum of Docklands Galleries with a BabyBjörn® baby carrier. The carrier will give the child the security and closeness they need, while keeping your hands free to explore our exhibits. The carrier has a fully adjustable seat width, suitable for newborns and above, with four front and back carry positions. For more information, please speak to a member of staff at the information desk. Please note that visitors are responsible for fitting the carriers. Child-sized ear defenders are available at the Information Desk. Our Morning Explorers events are specially designed for families with children on the autistic spectrum. The events take place from 8.30-10am (before the museum opens to the public) and families can discover our galleries in a relaxed and quieter environment. Please email us on [email protected] for upcoming Morning Explorer session dates. You can also download sensory maps of the museum for both sites below. Helping hosts is a service for all disabled visitors and their families which offers an extra pair of hands during your visit. A trained member of the museum’s Visitor Services team will be available to accompany you on your visit for up to two hours. Please book at least two weeks in advance. When booking, please provide your contact details and we will get back to you to discuss your individual needs. We run a range of accessible events including guided walks in British Sign Language and audio described gallery tours. View our calendar of accessible events. For more information or to discuss in detail how we can assist you on your visit please contact us. We also welcome any suggestions about how we can become more accessible. What's on at the Museum of London Docklands?